Want proof that the Left is coordinating its messages? Compare the article written by Winston-Salem/Forsyth County teacher Stu Egan with the letter to the editor written by Meredith College English professor Kelly Roberts. And while it is expected that Stoops would tout the “competition” angle to improving public schools, he misinforms the public about the true origins of charter schools: they were designed to be experimental campuses to find new and different ways of reaching students. They were supposed to be part of the actual school district and successful practices found were to be brought back to the entire school system. Charter schools were not designed to create competition. They were designed to foster collaboration and exploration and sharing. And there are some in this state that do just that and they are fantastic, but creating a charter school just to promote “school choice” is erroneous. Many thanks for the article “Popularity of charter schools is causing this NC school district to lose students” (Jan. 7) and the quotation from Terry Stoops, vice president of research for the John Locke Foundation. Directly from Stoops: “Charter schools were designed to foster competition with districts.” Not, as we were told in 1997 when charters started, to foster innovation. Not labs free from some regulations so we could find the best ways to benefit all kids. Not think tanks full of the best people working together with school districts on behalf of equity and excellence for all. These are children. We know better, and this rare admission can help us choose better for the state of North Carolina, once a national leader in education. Update (1/15): Thanks to Facebook, we have our answer! (Kinda.) Stu Egan claims that there was no coordination and that it was “common knowledge” that charter schools were not created with competition in mind. Therefore, he contends that Dr. Roberts is simply conveying that “common knowledge” in the same way that he did. The historical record appears to contradict that claim. 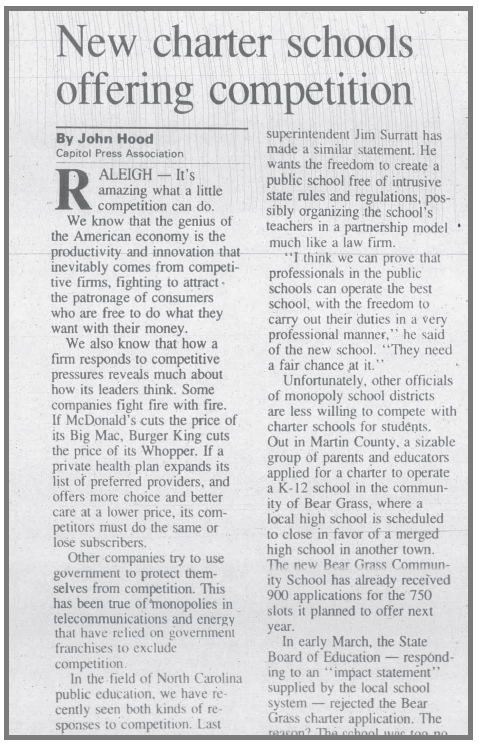 I have found a number of articles from the Associated Press and other sources that mention competition in the years before and after the passage of charter school legislation. Regardless, I suppose it’s possible that Egan and Dr. Roberts independently conveyed “common knowledge” within their anti-choice echo chamber, but it is incorrect according to the sources I have found, such as the one below.